In this tutorial, you create your organization and configure it with two AWS member accounts. You create one of the member accounts in your organization, and you invite the other account to join your organization. Next, you use the whitelisting technique to specify that account administrators can delegate only explicitly listed services and actions. This allows administrators to validate any new service that AWS introduces before they permit its use by anyone else in your company. That way, if AWS introduces a new service, it remains prohibited until an administrator adds the service to the whitelist in the appropriate policy. The tutorial also shows you how to use blacklisting to ensure that no users in a member account can change the configuration for the auditing logs that AWS CloudTrail creates. The following illustration shows the main steps of the tutorial. In this step, you create an organization with your current AWS account as the master account. You also invite one AWS account to join your organization, and you create a second account as a member account. Next, you create two organizational units (OUs) in your new organization and place the member accounts in those OUs. You can apply restrictions to what actions can be delegated to users and roles in the member accounts by using service control policies (SCPs). In this step, you create two SCPs and attach them to the OUs in your organization. You can sign in as users from each of the test accounts and see the effects that the SCPs have on the accounts. None of the steps in this tutorial incurs costs to your AWS bill. AWS Organizations is a free service. This tutorial assumes that you have access to two existing AWS accounts (you create a third as part of this tutorial) and that you can sign in to each as an administrator. 111111111111 – The account that you use to create the organization. This account becomes the master account. The owner of this account has an email address of masteraccount@example.com. 222222222222 – An account that you invite to join the organization as a member account. The owner of this account has an email address of member222@example.com. 333333333333 – An account that you create as a member of the organization. The owner of this account has an email address of member333@example.com. Substitute the values above with the values that are associated with your test accounts. We recommend that you don't use production accounts for this tutorial. In this step, you sign in to account 111111111111 as an administrator, create an organization with that account as the master, and invite an existing account, 222222222222, to join as a member account. Sign in to AWS as an administrator of account 111111111111 and open the AWS Organizations console at https://console.aws.amazon.com/organizations/. On the introduction page, choose Create organization. In the Create new organization dialog box, choose ENABLE ALL FEATURES and then choose Create organization. Choose Settings in the upper-right corner and confirm that your organization has all features enabled. The feature set is listed in the Organization details section of the Settings page. You now have an organization with your account as its only member. This is the master account of the organization. Now that you have an organization, you can begin to populate it with accounts. In the steps in this section, you invite an existing account to join as a member of your organization. Open the Organizations console at https://console.aws.amazon.com/organizations/. Choose the Accounts tab. The star next to the account name indicates that it is the master account. Now you can invite other accounts to join as member accounts. On the Accounts tab, choose Add account and then choose Invite account. Type any text that you want into the Notes box. This text is included in the email that is sent to the owner of the account. Choose Invite. AWS Organizations sends the invitation to the account owner. If you get an error that indicates that you exceeded your account limits for the organization or that you can't add an account because your organization is still initializing, wait until one hour after you created the organization and try again. If the error persists, contact AWS Support. Open the email that AWS sent from the master account and choose the link to accept the invitation. When prompted to sign in, do so as an administrator in the invited member account. Open the AWS Organizations console (https://console.aws.amazon.com/organizations/) and sign in as an administrator of the member account. Choose Invitations. The number beside the link indicates how many invitations this account has. On the Invitations page, choose Accept and then choose Confirm. Sign out of your member account and sign in again as an administrator in your master account. In the steps in this section, you create an AWS account that is automatically a member of the organization. We refer to this account in the tutorial as 333333333333. On the AWS Organizations console, on the Accounts tab, choose Add account. For Full name, enter a name for the account, such as MainApp Account. For Email, enter the email address of the individual who is to receive communications on behalf of the account. This value must be globally unique. No two accounts can have the same email address. For example, you might use something like mainapp@example.com. For IAM role name, you can leave this blank to automatically use the default role name of OrganizationAccountAccessRole, or you can supply your own name. This role enables you to access the new member account when signed in as an IAM user in the master account. For this tutorial, leave it blank to instruct AWS Organizations to create the role with the default name. Choose Create. You might need to wait a short while and refresh the page to see the new account appear on the Accounts tab. In the steps in this section, you create organizational units (OUs) and place your member accounts in them. Your hierarchy looks like the following illustration when you're done. The master account remains in the root. 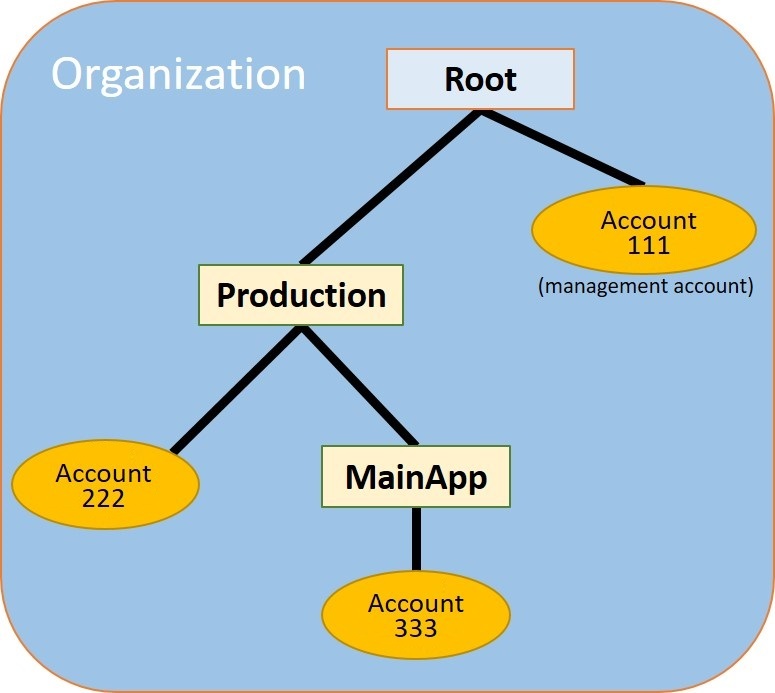 One member account is moved to the Production OU, and the other member account is moved to the MainApp OU, which is a child of Production. On the AWS Organizations console, choose the Organize Accounts tab and then choose + New organizational unit. For the name of the OU, enter Production and then choose Create organizational unit. Choose your new Production OU to navigate into it and then choose + New organizational unit. For the name of the second OU, enter MainApp and then choose Create organizational unit. Now you can move your member accounts into these OUs. In the tree view on the left, choose the Root. Select the first member account, 222222222222, and then choose Move. In the Move accounts dialog box, choose Production and then choose Move. Select the second member account, 333333333333, and then choose Move. In the Move accounts dialog box, choose Production to expose MainApp. Choose MainApp and then choose Move. In the steps in this section, you create three service control policies (SCPs) and attach them to the root and to the OUs to restrict what users in the organization's accounts can do. The first SCP prevents anyone in any of the member accounts from creating or modifying any AWS CloudTrail logs that you configure. The master account isn't affected by any SCP, so after you apply the CloudTrail SCP, you must create any logs from the master account. Choose the Policies tab and then choose Create policy. For Policy name, enter Block CloudTrail Configuration Actions. In the Policy section on the left, select CloudTrail for the service. Then choose the following actions: AddTags, CreateTrail, DeleteTrail, RemoveTags, StartLogging, StopLogging, and UpdateTrail. The policy statement on the right updates to look similar to the following. The second policy defines a whitelist of all the services and actions that you want to enable for users and roles in the Production OU. When you're done, users in the Production OU can access only the listed services and actions. From the list of policies, choose Create policy. For Policy name, enter Whitelist for All Approved Services. Position your cursor in the right pane of the Policy section and paste in a policy like the following. The final policy provides a blacklist of services that are blocked from use in the MainApp OU. For this tutorial, you block access to Amazon DynamoDB in any accounts that are in the MainApp OU. From the Policies tab, choose Create policy. For Policy name, enter Blacklist for MainApp Prohibited Services. In the Policy section on the left, select Amazon DynamoDB for the service. For the action, choose All actions. Choose Create policy to save the SCP. Before you can attach a policy of any type to a root or to any OU within a root, you must enable the policy type for that root. Policy types aren't enabled in any root by default. The steps in this section show you how to enable the service control policy (SCP) type for the root in your organization. Currently, you can have only one root in your organization. It's created for you and named Root when you create your organization. On the Organize accounts tab, choose your root. In the Details pane on the right, under ENABLE/DISABLE POLICY TYPES and next to Service control policies, choose Enable. Now that the SCPs exist and are enabled for your root, you can attach them to the root and OUs. Still on the Organize accounts tab, in the Details pane on the right, under POLICIES, choose SERVICE CONTROL POLICIES. Choose Attach next to the SCP named Block CloudTrail Configuration Actions to prevent anyone from altering the way that you configured CloudTrail. In this tutorial, you attach it to the root so that it affects all member accounts. The Details pane now shows by highlighting that two SCPs are attached to the root: the one you just created and the default FullAWSAccess SCP. Choose the Production OU (not the check box) to navigate to its contents. Under POLICIES, choose SERVICE CONTROL POLICIES and then choose Attach next to Whitelist for All Approved Services to enable users or roles in member accounts in the Production OU to access the approved services. The information pane now shows that two SCPs are attached to the OU: the one that you just attached and the default FullAWSAccess SCP. However, because the FullAWSAccess SCP is also a whitelist that allows all services and actions, you must detach this SCP to ensure that only your approved services are allowed. To remove the default policy from the Production OU, next to FullAWSAccess, choose Detach. After you remove this default policy, all member accounts under the root immediately lose access to all actions and services that are not on the whitelist SCP that you attached in the preceding step. Even if an administrator in one of the accounts grants full access to another service by attaching an AWS Identity and Access Management (IAM) permissions policy to a user in one of the member accounts, any requests to use actions that aren't included in the Whitelist for All Approved Services SCP are denied. Now you can attach the SCP named Blacklist for MainApp Prohibited services to prevent anyone in the accounts in the MainApp OU from using any of the restricted services. To do this, choose the MainApp OU (not the check box) to navigate to its contents. In the Details pane, under POLICIES, expand the Service control policies section. In the list of available policies, next to Blacklist for MainApp Prohibited Services, choose Attach. If you sign in as a user in the master account, you can perform any operation that is allowed by your IAM permissions policies. The SCPs don't affect any user or role in the master account, no matter which root or OU the account is located in. If you sign in as the root user or an IAM user in account 222222222222, you can perform any actions that are allowed by the whitelist. AWS Organizations denies any attempt to perform an action in any service that isn't in the whitelist. Also, AWS Organizations denies any attempt to perform one of the CloudTrail configuration actions. If you sign in as a user in account 333333333333, you can perform any actions that are allowed by the whitelist and not blocked by the blacklist. AWS Organizations denies any attempt to perform an action that isn't in the whitelist policy and any action that is in the blacklist policy. Also, AWS Organizations denies any attempt to perform one of the CloudTrail configuration actions.